The Makauwahi Cave “fear, break through” is the small portion of the largest limestone cave found in Hawaii. It lies on the south coast of the island of Kauaʻi, in the Māhāʻulepū Valley close to Māhāʻulepū Beach, and is important for its paleoecological and archaeological values. It is reached via a sinkhole and has been described as “…maybe the richest fossil site in theHawaiian Islands, perhaps in the entire Pacific Island region”. The pale rock ridge that houses the sinkhole started as a field of sand dunes. Over time, rainwater seeped through the sand, converting it chemically into limestone rock. Underground water ate away at the lower parts of the limestone, forming an extensive complex of caves, and finally one large section of cave roof collapsed, creating a feature known as a sinkhole. The feature is as much as 100 yards long from the entrance to the most distant known cave, and as much as 40 yards wide, but it may contain other caverns whose entrances are buried. The Makauwahi Sinkhole is a small portion of the largest limestone cave found in Hawaii. Paleoecological and archaeological excavations of the sediment that has filled the pond in the sinkhole put its age at some 10,000 years. 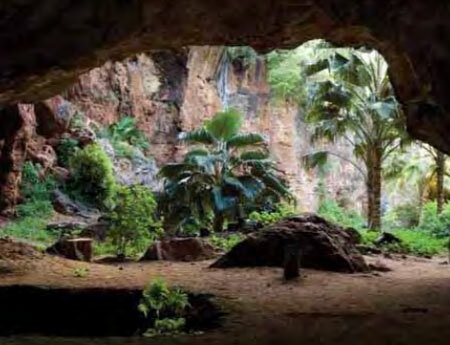 More importantly, the findings of this study show how the first humans that inhabited Kauai affected the pre‐human natural environment. It is one of only a handful of sites in the world that show such impact. ￼The findings from a multiyear archaeological dig at the sinkhole by Dr. David and Linda Pigott Burney’s have profound implications for proposals to reforest parts of the archipelago with native vegetation, since it shows that coastal forests included a wide range of plants long thought to be limited to upland habitats. A reforestation program is in place to restore the environment to its pre‐human condition by re‐planting indigenous species. Before the first Polynesian settlers set foot on Kaua‘i, Hawai‘i was a strange Eden, empty of mammals, reptiles, and amphibians, because none had ever made it across the vastness of the Pacific to these remote islands. An array of native birds that had evolved in splendid isolation filled every kind of niche. More than 40 species of extinct native bird fossils have been excavated from Makauwahi, including an odd long‐legged owl, which specialized in hunting small forest birds, and a nocturnal duck with shrunken eyes. Among the bones discovered at Makauwahi were those of one lumbering flightless duck with a heavy bill designed to graze like a tortoise on short, tough grass and vegetation from rocks.